Training is a vital component of workplace efficiency especially when it comes to one of the most important deliverables of a clinical trial – the Trial Master File (TMF). Perhaps that’s why, according to a recent article in Forbes magazine, US companies spent over $70 billion on corporate training in 2014, an increase of 15% over the previous year. If you are lucky enough to oversee the TMF, you spend so much time bringing the right employees onboard, it only makes sense you would understand the importance of providing them with the proper training to ensure your TMF is always inspection ready. Experienced employees can spend significant time answering the questions of the less experienced, decreasing the productivity of your best employees. Perhaps even worse than that, poorly trained employees make more mistakes (i.e. inconsistencies), causing issues that more than likely someone else will have to clean-up. Comparatively, well-trained employees can reduce mistakes, prevent redundancies (less regulatory findings) and increase revenues (i.e. bringing products to market faster). Structured TMF training ensures that employees have a consistent experience and background knowledge of the content. The consistency is particularly relevant for the TMF and how it relates to regulations, your company’s basic procedures and processes. TMF employees should be aware of the expectations and procedures within your company. TMF training in these areas (at minimum) ensures that all staff members at least have exposure to the information. One thing we often see is high turnover in TMF departments. One of the most effective ways to retain employees it to provide them with access to training and development programs which creates a supportive working environment. TMF training provides opportunities and will make employees feel appreciated which will in turn make them feel more satisfied with their jobs. With a higher level of satisfaction, employee moral and loyalty will increase and turnover will decrease. Like most industries, technology has altered the way we manage the TMF as many companies now choose to maintain electronic TMFs, or eTMFs, for their clinical trials. This change provides opportunities for improvement in comparison to paper TMFs and previously unforeseen challenges. How do we set up eTMFs? What sort of Standard Operating Procedures (SOPs) will our employees need to follow to ensure successful clinical trials? Are our SOPs optimal for an eTMF? How do we switch from paper TMFs to eTMFs? LMK Clinical Research Consulting (LMK) recently introduced our innovative TMF University training and consulting curriculum. 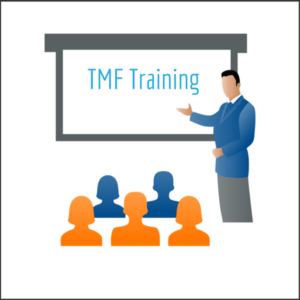 The TMF University is an all-inclusive program offering 18 in-depth training customized for novice, intermediate, or advanced TMF users. After a comprehensive discussion about your TMF training needs, LMK will work—with your company—to select the precise blend of training modules required to fill in any gaps in your company’s knowledge base. For example, a less experienced company may choose training modules about document recognition, TMF overview, and TMF storage while a company that has longstanding SOPs in place already may want to receive instruction on the most recent regulations regarding TMFs and request a deep dive into their TMF quality control procedures. Companies considering a move to eTMFs may choose the modules explaining an overview of eTMF systems and best practices. No one knows the needs of your company as you do, which is why this specialized instruction allows you to focus in on your greatest areas of need. Once you enroll in TMF University, LMK will provide this training to the employees you choose in the form of two- to three-hour courses led by respected industry professionals with years of experience in the pharmaceutical world. Training can be delivered in-person and includes hands-on instruction, case studies for practice, and knowledge checks. Why Choose LMK’s TMF University? Given all that’s at stake with clinical research, it is crucial that the TMF is stored in a secure and consistent manner to avoid the risk of regulatory findings. It’s every company’s worst nightmare to pour hundreds of hours into research and see a successful clinical trial invalidated by substandard TMF processing caused by the errors of untrained employees. LMK Clinical Research Consulting has positioned themselves as the foremost experts in TMF and eTMF regulations, storage, quality control, and best practices. Allow LMK to show you their great work, so when the auditors and regulatory inspectors come calling, you can gladly show them yours. For more information about the revolutionary TMF University program or to set up a complimentary consultation, contact us today!